Yesterday we celebrated Miss 4's Birthday with an afternoon tea party at a play park with a few of her little friends. Miss 4 & her friends had a great time playing on the equipment (monkey bars are now a hit as the girls showcase their skills to each other) and, as always, the parachute Miss just-turned-4 received for her 2nd birthday provided plenty of entertainment for the children - we saw many smiles & giggles. I decided to make the birthday cake (that Miss 4 had decided on months ago) myself. I was going to source all the different ingredients/decorations individually but to save time & money I ended up buying a kit from Gold Coast based business Cake 2 The Rescue. 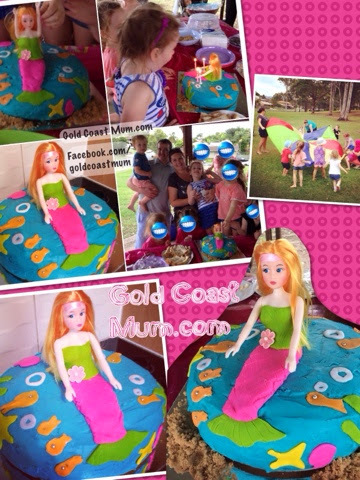 The business, which is a huge hit on Facebook with around 40,000 likers, posts out the cake rescue kits & also have a warehouse in Mudgeeraba (near Worongary shops) where you can pick up a kit &/or other supplies. Miss 4 & I went for our first solo outing in a very long time (while Mr 2 & the twins were fast asleep & being looked after at home) to pick up the kit & do the grocery shopping for the party. Not only was it a nice outing for us both, but it was so easy compared to outings with all four children which includes prams/baby capsules/baby carrier/nappy bags. Miss 4 & I just hopped out of the car & walked into the shops hand-in-hand. It was so lovely (simple things). Visiting Cake 2 The Rescue HQ/warehouse was interesting - Miss 4 liked looking at all the supplies. 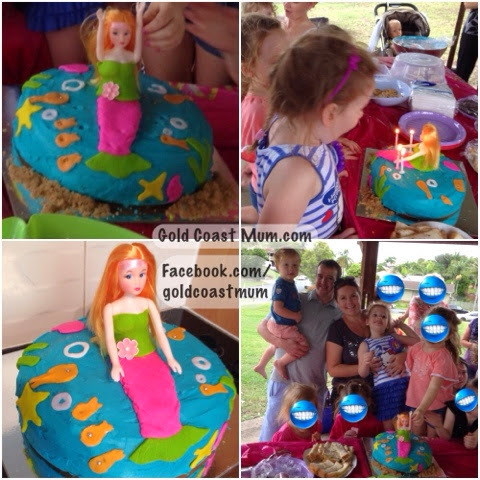 We chatted with the lovely owner who let Miss 4 choose between a brunette doll for her mermaid cake, or a red head more reminiscent of Ariel from The Little Mermaid (which she chose of course). The night before the party, Miss 4 & Mr 2 'helped' me make the cake. From cracking the eggs, to pouring in the milk, they were both very involved & the kitchen was certainly a mess as you can imagine. 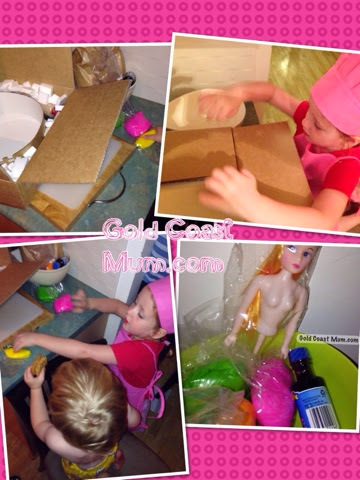 The kits come with everything you need from a baking tray to food colouring, fondant, rolling pin & more. The introductions were easy to follow (thankfully). Miss 4 & Mr 2 insisted on helping to decorate the cake which was fine til they started combining colours to my freshly-rolled-out fondant. So it was a rush job while I was trying to keep their paws away (& repeatedly tidying our house & garden in case it rained & the party moved to our place, while feeding the twins, prepping other food & a million other things but thankfully my Mum, Nanna & sis arrived early to lend a hand). My blue ocean icing did have a textured look so it'd look like the sea, but it dried flat/smooth so kind of lost that effect. The 'sand' looked & tasted great. Obviously I could have done better if I had more time up my sleeve but happy it was at least presentable & edible. An achievement if you've seen how far I've come since my attempt for Miss 4's 1st birthday cake (I'll share pics in a different blog post). Miss 4 was overjoyed with her cake & it tasted delicious! It was a success (success meaning = the birthday girl was excited & thankful, the kids could recognise what it was supposed to be, & it was yummy). Hooray!